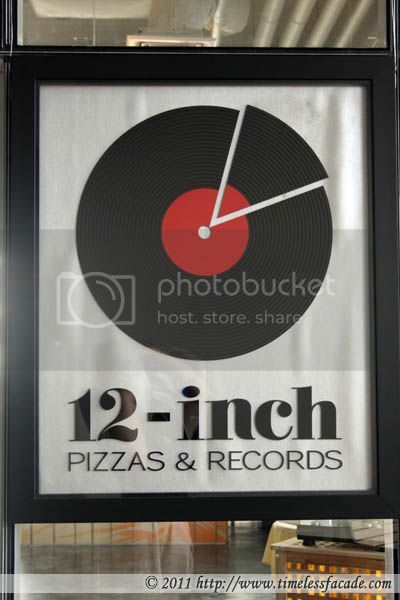 I've always been a fan of Timbre's pizzas so when they came a knocking with an invitation to try out their latest offering, 12 Inch Pizzas & Records, I gladly jumped at the opportunity. 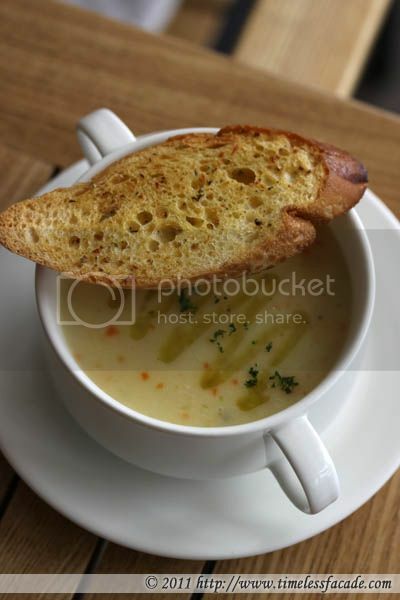 The restaurant is located on the 4th floor or V Hotel, a newly opened hotel directly above Lavender MRT and opposite the ICA. Getting up to the 4th floor can pose quite a problem as the hotel requires you to scan your card in the lift before you can select your desired floor. However, there is apparently a fireman's lift which doesn't have such requirements so you might want to consider utilising it. 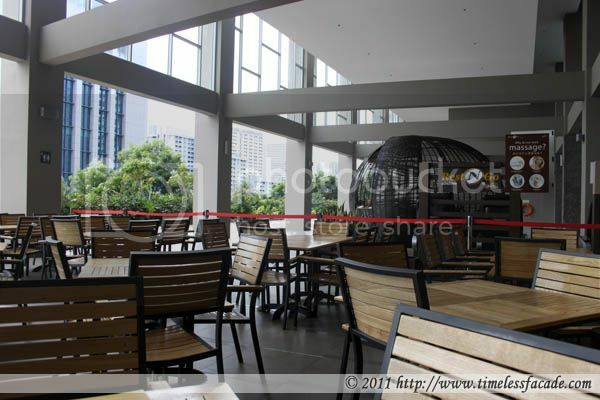 The alfresco dining area occupies a huge section; one that's at least twice as large as the indoor dining area (which is very noisy and not conducive for conversations in my humble opinion). Sitting alfresco allows you a view of the neighbouring and distant buildings (ICA is one of them) and the blue skies that pervade the emptiness in between. 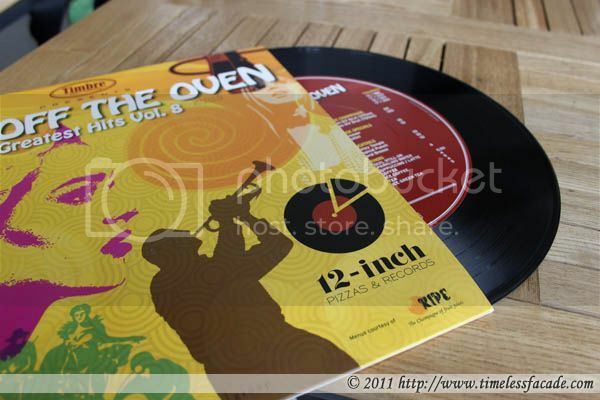 Interestingly, the menu comes in the form of a record, back from the days when gramophones were still in vogue. Catchy, really. Nothing like a bowl of good soup to get things going. But unfortunately, the soup was lacklustre. A little too diluted without the creaminess of chowder and richness of seafood. Forgettable. 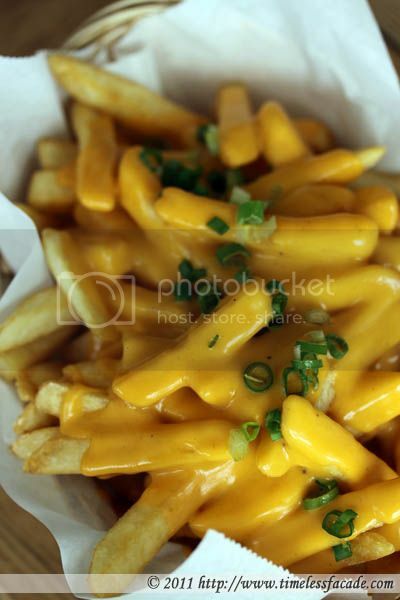 I actually love cheese fries but this was disappointing as well. The cheese was a little too watery for my liking and lacked the "gooeyness" I was expecting. Credits to the fries though, which were of a nice thickness and decently done. With absolutely no affiliation to the Irish pop group, "The Cranberries", this pizza was one of the many with names playing on various song titles and group names. What I particularly liked about this pizza was the nice comforting taste it brought to the table. 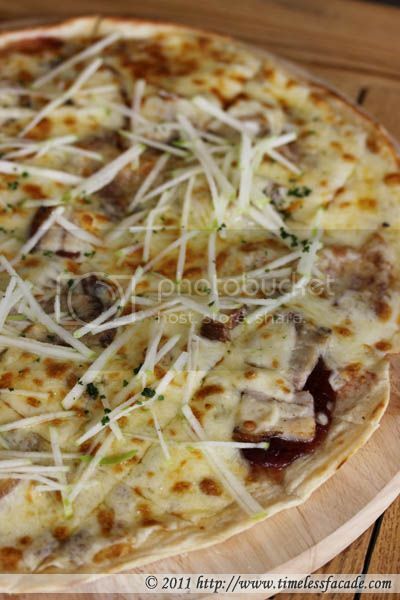 Mild cranberry sauce coupled with pork belly, cheese and a nice thin and chewy pita like base and topped with slivers of crunchy green apple. Not your conventional pizza but I love it! Shrimps, sweet garlic butter, curry leave sauce, cheese and topped with crispy egg and cereals - sounds like a mish mash of ingredients but in reality, a combination that worked well! 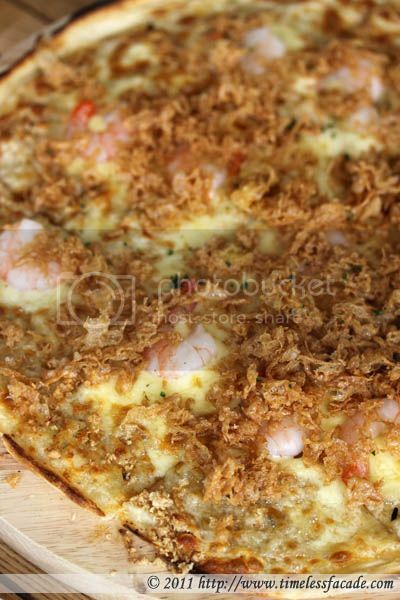 Sandwiched between the cheese and pita like base was a generous layer of sweet garlic butter while the crunchy shrimps (probably soaked in alkaline water) were topped with crunchy cereal and fluffy egg swirls (just like the kind you would find in fried fish soups). Delicious! However, too much of it made me nauseous because it did come across as very oily. So eat in moderation or share! Our first dessert came in the form of a 12 inch pizza as well but well, I'm not complaining. 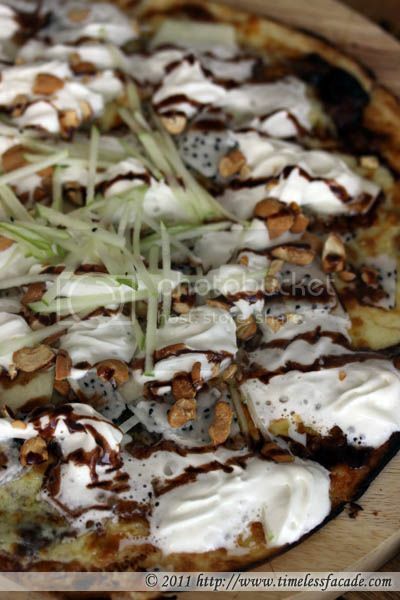 A layer of chocolate sauce beneath the cheese, sprinkled with fruits and topped with copious amounts of whipped cream. Not exactly the healthiest dessert, but it tasted interesting - Slightly savoury from the cheese but predominantly chocolatey. If you can't accept chocolate together with cheese, I would suggest you not to try this. 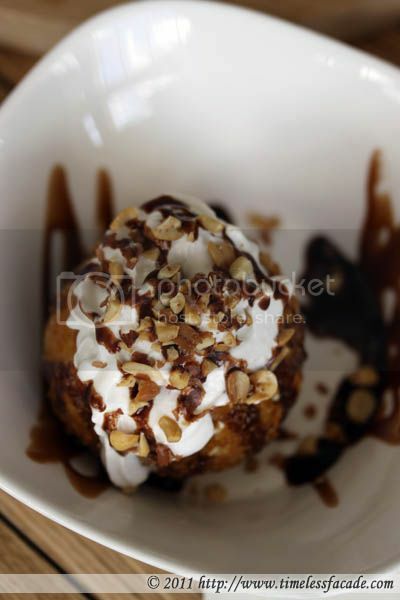 Our other dessert and the only one in the current dessert menu that wasn't a pizza, the kid friendly deep fried ice cream. I didn't think too much of it though as the flour was too thick and hard for my liking. Also, the coconut ice cream encased within tasted really artificial. I would skip this in a heartbeat. 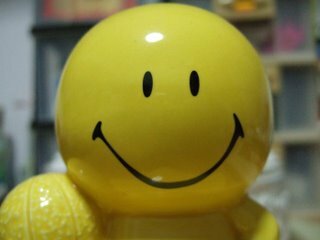 Overall, I had a wonderful and belly bursting lunch. Though the sides were merely pedestrian, the focus should be on the wonderful pizzas, which Timbre has grown to be associated with. On this note, I would like to thank Timbre for the invitation once again!